status: it works. We've modified the code to work using an ESP8266 which publishes the measurement data directly on an MQTT stream. 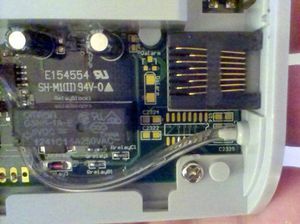 The G, C, D, V signals from the CO2-sensor inside the CO-100 are routed internally to the RJ45-plug, so there's actually no need to open it and solder a connector on the G, C, D, V lines. This project is about hacking the Voltcraft CO-100 CO2-meter, such that we can read the exact ppm value as displayed on the LCD. This particular CO2-meter is present in the main space of RevSpace. 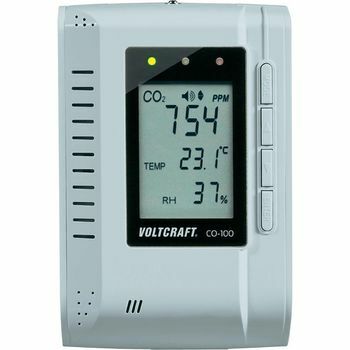 Having the CO2 ppm value available as a number allows for nice things such as logging the levels over time, announce them on IRC, show them on the LedBanner, fine-grained control of the ventilation system, etc. 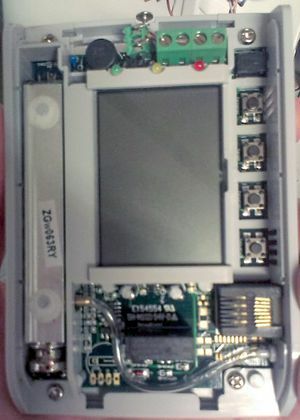 http://co2meters.com/Documentation/AppNotes/AN146-RAD-0401-serial-communication.pdf has some information on what looks like a clone/similar device, describing a serial cable for the RJ45, and the protocol used, as well as some info on re-calibration. Commands/Identifiers seem to match. byte 3 is a checksum over bytes 0-2, just the sum modulo 256. 0x46 'F' 6882 Temperature in degrees Fahrenheit (unit of 0.01)? 5V ? Supply voltage from 8P8C, about 6V! The basic function of the software on the arduino is to monitor the C and D signals, until a CO2 measurement is received from the ZG-01, then send it using the wireless transceiver. one for an ESP8266, sending measurement values directly to MQTT over the WiFi. The technical description for a very similar CO2 module: ZG106 protocol. revspace/sensors/co2 with the CO2 concentration in ppm, e.g. "400 PPM"
revspace/sensors/humidity with the relative humidity in percent, e.g. "43.56 %"
revspace/sensors/temperature with the temperature in degrees Celcius, e.g. "23.9 °C"
This page was last modified on 19 February 2018, at 14:33.